The doctors at the Sick Kids Hospital Eye Clinic confirmed the diagnosis of microphthalmia (small eye) for our baby. Her left eye is less than half the size of a normal eye, and the lens is still milky-white instead of clear – a sign that it prematurely stopped developing. She’s unlikely to be able to see anything more than light or shadow in that eye, if at all. It’s too small to operate on, and there’s no way to restore vision in that eye. Everything else (including her right eye) seems normal so far, so it might be isolated microphthalmia instead of part of a syndrome. We’ll be scheduled for a full pediatric check-up anyway, just in case. She’ll probably be able to see fine with her right eye. Lots of people get by with monocular vision. She’ll need to be careful about keeping vision in her right eye, of course. She’ll probably be near-sighted in he right eye like W- and me, so glasses will offer some protection. As her head grows, she’ll need to wear ocular prostheses to get the eye socket to be the right shape and size. She’ll go for her first fitting in a few months, when the risks for general anaesthesia are lower. An ocularist will make a mold and then create prostheses for her. That’ll help keep her face balanced as she develops. She’ll make an awesome pirate. Or cyborg. Or cyborg pirate. If she wants. Whatever life throws at us, we’ll just have to make the most of it. We’ll learn as much as we can, connect with other families figuring out similar challenges, and work on giving her a great start in life. 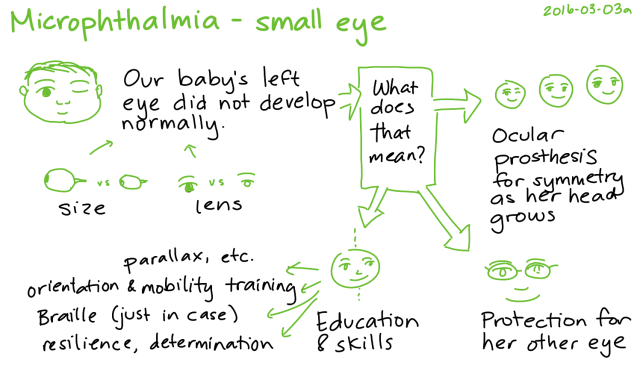 Treatment (anopthalmia.org): describes the process of expanding the eye sockets through prosthesis and tips for early intervention (ex: orientation and mobility training). A letter to new parents living with microphthalmia (wonderbaby.org): An article from someone with bilateral microphthalmia whose right eye developed enough to have usable vision, emphasizing the importance of constant stimulation, parental attitude, and Braille even for people with partial vision. Facts about anophthalmia and microphthalmia (nih.gov): describes prostheses needed until the age of 10. Assistive Device Program (health.gov.on.ca): Ontario program that pays up to 75% of the cost of equipment, including ocular prostheses; policy manual. The rest may be partially covered by insurance (through W-‘s work or my PHSP), or we can claim part of it as a medical tax credit. Sometimes I feel a little intimidated. Will we be able to effectively identify and advocate for whatever could help her? What will it be like helping her get the hang of caring for her prostheses? Can we give her enough of a solid emotional foundation so that she can weather the challenges ahead? But maybe this obstacle will become one of the ways we contribute to the world. W- has been wonderfully supportive. There will probably be rough patches, but we can get through this together. We’ll learn more over the next few months and in the years ahead. I’m working on getting a referral to the Canadian National Institute for the Blind so that we can tap into resources for kids with vision impairments. In the meantime, there are all the usual things to learn about life with a newborn, too. Onward.